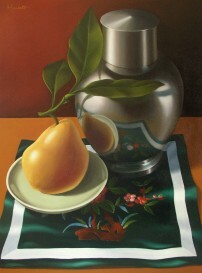 The Quicksilver Mine Co. presents a solo exhibition of still life oil paintings by Bay Area artist Pete Hackett beginning on December 15th. 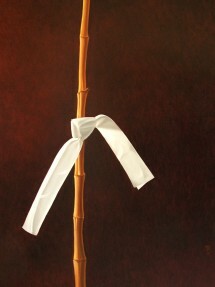 Opening with an Artist Reception on Saturday December 16th from 4—6pm, this Show will continue through January 21st. 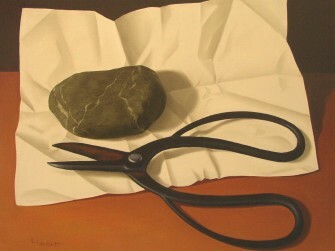 A realist painter, Hackett focuses on objects for their storytelling potential as well as their abstract qualities. "My approach is to visually redefine the familiar things around me in ways that I can’t express in words," he says. 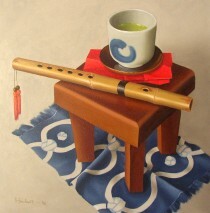 "I combine my love for the aesthetics of the East with traditional oil painting techniques of the West." 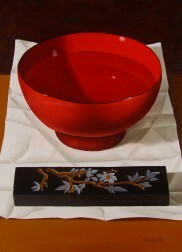 For subject matter he meditates on objects collected during travels in China and Japan: tea making vessels and utensils, small ceramic bottles and cups used for sake, bamboo flutes, incense, bronze statues, as well as mementos from his childhood. Using simple compositions, he then layers oil paint and transparent glazes over a toned canvas surface to create rich color and establish a softly nuanced mood in each painting. "The 19th century American painter Robert Henri stated that the purpose of painting was not to produce a picture, but to achieve that particular state of mind that one can attain while painting," says Hackett. "While I enjoy the challenge of faithfully rendering my subject, my ultimate goal is to transform the image in a manner that expresses its inner essence. 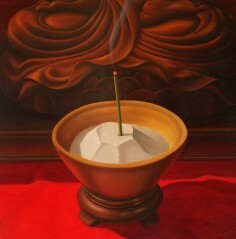 In this way, painting becomes meditation." 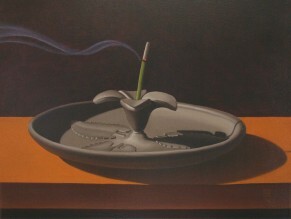 "Morning Incense," 20" x 27"
Pete Hackett received a Bachelor of Fine Arts from the University of Wisconsin. After a professional career in visual merchandizing and retail design, he recently retired from commercial and corporate work to focus on his own art. This is his first exhibition in Sonoma County. 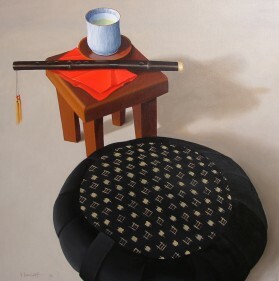 "Morning Practice," 34" x 34"
"A Wish," 40" x 30"
An Artist Reception for Hackett will be held on Saturday, December 16th from 4—6 p.m.
"Tri's Tea Cup," 24"x 24"
"Ink Stick and Fresh Water"